A company’s website is an important business asset that requires proper optimization to aid in the growth of the business. Without adequate website design and development, a website could have negative impacts on overall success. We live in a world where our consumers go online first to preview businesses, giving the task of a first impression to your website. Consumers window shop online, comparing each company’s website to help them make their purchase decisions. Whether you have a small or a large company, having a website that is professional, organized, user-friendly, content-driven, and brand consistent is key when establishing your business online. In order to accomplish a strong online presence, the combination of website design and website development go hand in hand. Without one or the other, your website can fall flat and can lack a positive lasting impression. Your website is the face of your business online, serving a very important role that sometimes goes unnoticed. The goal of your website is to show trust and credibility and who you are as a company. In addition, it should aid in the growth of your business. All of these goals are accomplished with the proper use of design and development. 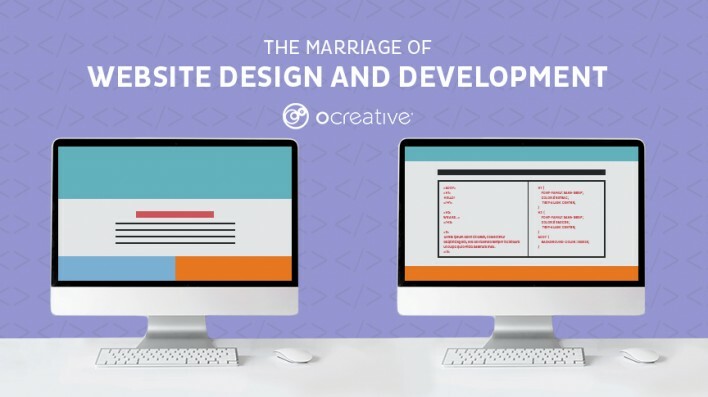 In this article, we dive into the importance of marrying website design with development to ensure your website is adding to the success of your business and not hurting it. Development also aids in the trustworthiness and credibility of your website. Slow loading times, poor navigation, and dead-end pages decrease your company’s credibility and can harm your business’ growth. A slow loading time is a major contributor to user abandonment. Forty percent of people abandon a website that takes more than 3 seconds to load (Kissmetrics). According to John Mueller, Google’s Senior Webmaster Trends Analyst, your website should load in fewer than 2 or 3 seconds. Both design and development contribute to proper navigation. From a usability standpoint, proper website design ensures the website is user-friendly and pages of your website can be explored easily. Site navigation acts as a map for your user, guiding them through the pages of your website. Menu structure should be clear and concise, with the proper balance of headings and drop downs. Calls to action should be properly placed on all pages. However, each call to action needs to be appropriate and relevant to the content on each page. For example, a “Contact Us” button at the bottom of a service page or a “Read more” link at the end of a blog article should be employed. Proper site internal linking also has benefits from an SEO standpoint. Internal linking throughout your website helps with crawling and indexing. When a search bot crawls your website, it follows the internal linking structure you have in place, allowing it to index deeper, less-visited pages. A business website must be properly branded. A brand is the promise of a distinct, memorable experience every time a point of contact occurs. It is about creating an expectation and delivering that expectation consistently. Your website tells the story of who you are as a company, and without proper design, your message can become muddled and a different message can be received. Your user wants a consistent experience every time they come into contact with your business; a properly branded website will deliver on that expectation. All of the topics we touched upon above contribute to SEO. Providing clear and relevant information with a developed SEO strategy increases your organic search result presence. In addition, the factors we discussed are a part of Google’s ranking algorithm. 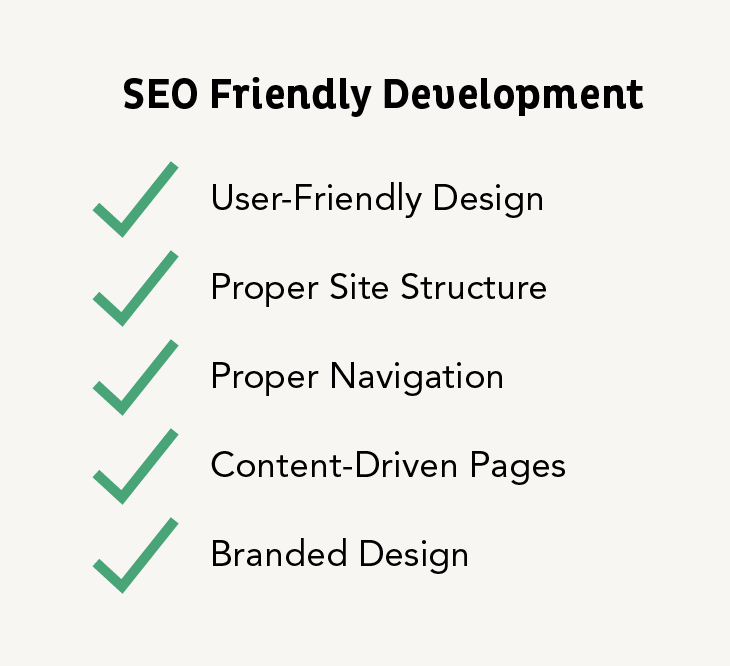 A professional and user-friendly design, proper site structure and navigation, content-driven pages, and branded design all will benefit search results positively. Always remember your website acts as the store front of your business in the online world. The modern age requires businesses to be conscientious when developing and designing their websites to ensure a positive contribution to growth. Unfortunately, a bad website could be more detrimental to a business than not having one, exhibiting the need for proper site design and development. As you create or redesign your website, always pair design and development as they weigh equally in importance.